The 18-foot oarfish that was stranded on the beaches of Catalina Island on Oct. 13, 2013. Last fall, there was a big buzz across the internet when two rare events happened just five days apart: the stranding of two dead oarfish on southern California beaches. On Oct. 13, an 18-footer was found on Catalina Island, and on Oct. 18, a 14-footer was found on the beach in Oceanside. The oarfish is an amazing-looking sea creature, with a long, flat, serpentine body, a long dorsal fin along the entire length of its body, and tiny spine-like pectoral and pelvic fins. It is thought to have been the source of some of the “sea serpent” legends, since large specimens can be up to 50 feet (15 m) long. The fact that two such strandings had happened so closely in time generated most of the buzz, since strandings are normally rare, with one or two a year at most. Once in awhile there are accidental sightings of oarfish which are apparently trying to beach themselves, such as shown in this remarkable footage. In February of this year, there was another round of media sensationalism when it was reported that a number of popular brands of lipstick contain potentially dangerous levels of lead. This is not a new claim; it has popped up a number of times, including during the 1990s and again in 2007. Octopus’ Garden in the Shale? Even before the annual meeting of the Geological Society of America (GSA) in Minneapolis started on October 9, there was a huge buzz among my colleagues about this remarkable abstract that claimed evidence of a giant squid, or “Kraken”, that had arranged the bones of the whale-sized ichthyosaurs (marine reptiles shaped like dolphins) from Berlin-Ichthyosaur State Park in Nevada. There was a post on the October 10 page of Pharyngula.org, and also one on Brian Switek’s Laelaps blog, “The Giant Prehistoric Squid that Ate Common Sense”. The only things geologists and paleontologists could evaluate was a short abstract, but it made such a sensational claim that the press was buzzing and the story was all over the internet. Image of the ichthyosaur bones, showing the "alignment" of the disk-shaped vertebral centra that are alleged evidence of cephalopods arranging the bones. On Monday, my family and I attended the annual Fourth of July Parade in Sunland-Tujunga, California. We go nearly every year, and most years they have virtually the same lineup: lots of classic antique cars and hot rods and ATVs and motorcycles, plus flatbed trailers and marchers from church groups, anti-abortion groups, Boy Scouts, Cub Scouts, and Girl Scouts, the local Lions, Kiwanis, and other social clubs, horses from the upscale Shadow Hills neighborhood (where movie stars with horses, like Patrick Swayze, lived), fire trucks (including a lot of antique fire trucks and ambulances that come from a company in Sun Valley that supplies them for movie shoots), minor movie stars, TV actors, and local officials—and a small portion of the local high school band (because they’re out of school and mostly out of town by mid-summer). 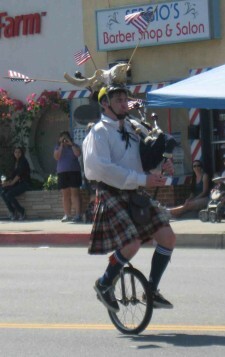 This is not your typical small town Fourth of July parade, because Sunland-Tujunga is not your typical small town. Once a foothill retreat from the city with lots of “mountain cabins”, it is one of the last Anglo enclaves in the City of Los Angeles. Long ago it was settled mostly by former hippies and bikers, so it is “redneck-NASCAR” heaven (mostly lower-middle class whites). Nearly all of the rest of the City of Los Angeles (and its school district) is largely Latino and African-American now. The parade is very casually organized, and almost anyone can march if they want to. Often, it drags on for more than an hour with large gaps between units, because there isn’t much control over the marchers (except for LAPD putting traffic barricades along the parade route). It is very different from the Rose Parade on New Year’s Day in nearby Pasadena, which is a highly professional, tightly run, multi-million-dollar enterprise with floats that cost more than most houses, and worldwide TV coverage. By contrast, the Sunland-Tujunga parade’s “floats” were mostly flatbed trucks with simple decorations, or old hay wagons pulled by tractors. There were a few changes from previous years: the parade was not led off by the LAPD motorcycle drill team (must be the budget cuts), but instead by a guy wearing a kilt and a cow-skull bike helmet ornamented with flags playing bagpipes on a unicycle. 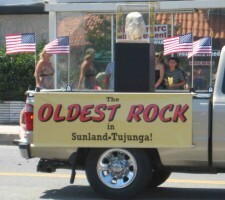 Then there was first for any parade I’ve seen: a float (actually a pickup truck) displaying the “oldest rock in Sunland-Tujunga”—although even from the sidewalk I could tell it was Mt. Lowe Granodiorite (220 m.y. old), not the actual oldest rocks in our local mountains, the Mendenhall Gneiss (1.7 billion years old)(check out the video link above—they actually did a very clever parody of geology, and the rock has its own Facebook page). There were very few local politicians (Congress is still back in D.C. fighting over the budget and the debt ceiling, so they can’t come home). And it was not nearly as political as in previous years, with only a few cars and people touting the local GOP club. It was just one of those silly “fluff” stories they put on CNN to fill up the hours between commercials and bits of real news. The anchors were reporting on a study that surveyed the most common CEO names. With straight faces, they reported that the most common men’s CEO names were short single-syllable, mostly four-letter names like Jack, Fred, Bill, Peter, Bob, and Bruce. The most common women’s CEO names were Deborah, Debra, Sally, Cynthia, and Carolyn. Their tiny bit of “analysis” of this undigested factoid by an “onomastics specialist” (a scholar who specializes in names) was that “shortened versions of given names are often used to denote a sense of friendliness and openness. Female CEOs, on the other hand, use their full name to project a more professional image.” And, like most other stories on Headline News, CNN, USA Today, and other media which consist of no more than a few sentences of information and some superficial comment or analysis, that was it. No further discussion about why those names tend to be most common among CEOs. It was such a jaw-droppingly stupid piece of tabloid journalism that I was intrigued to look it up and see what was really behind the story. But the story on the Linked-In site is not much longer or detailed than the reporting on CNN. Many other media on the web picked up the same story and gave it the same superficial level of discussion. All the site did was a simple analysis of correlations between occupations and first names, based on their data set of Linked-In members of professionals who join the site for networking purposes (which skews the result right there—it’s not based on a random sample of names from census data or any large, rigorously collected data set). But is it true, as they imply, that the name that parents give their child somehow determines what kind of profession they might enter? Does a decision most parents make before we are born lock us into certain types of jobs? Are we fated, like the boy named Sue in the Johnny Cash song, to follow a certain path because a parental choices? This Sunday before game-time you might want to set your Tivos to record Dateline. This week, supposedly, Matt Lauer interviews Dr. Andrew Wakefield and several other affiliates of the Thoughtful House Center for Children, along with Dr. Paul Offit and journalist Brian Deer. The Thoughtful House agreed to the interviews because they figured they would get fair treatment from the likes of Matt. I’m interested to see what kind of a program NBC has put together on this very sensitive subject. Depending on how this major media outlet writes the script, it could either be a major affirmation of what many within the science community already know, or it could increase the divide between anti-vax’ers and science. Please, Matt… don’t go Jenny McCarthy on us. Don’t do the usual journalistic job of being “fair-and-balanced”. This is not a “he said, she said” issue. This is science. Do tell the world what the science supports.